Siggy Zee - 928 - Christchurch Roller Derby. Strong City. Stronger Skaters. My real name is Sigourney so Siggy. 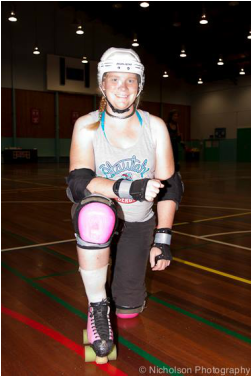 The Zee comes from the nickname of a Skater in the states that inspired me to do derby. I combined them to Siggy Zee for my name. At my first interleague bout I got the final points needed to secure a win during the final Jam. Staying fit and able for derby in the face of injury. The standing still looking awkward move.